KUALA LUMPUR (Reuters) - Ten years to the day after he was sworn in, disgraced former Malaysian Prime Minister Najib Razak is expected to go on trial on Wednesday suspected of corruption linked to a multibillion-dollar scandal that brought down his government. 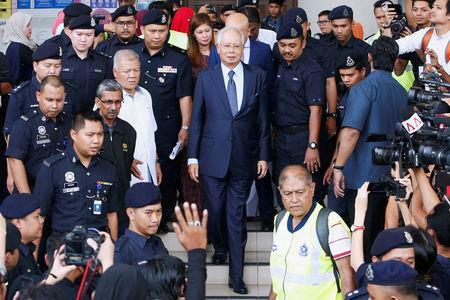 The trial relates to suspected transfers totalling 42 million ringgit ($10.3 million) into Najib's bank account from SRC International, a former 1MDB unit. Attorney-General Tommy Thomas is expected to deliver the prosecution's opening statement at Kuala Lumpur High Court, Bernama state news agency reported. Prosecutors are prepared to call more than 60 witnesses, and three of them - described as government and banking officials - could take the stand on Wednesday, Bernama said, quoting unnamed sources. The trial was originally set to begin on Feb. 12, but was delayed pending appeals by Najib's lawyers. On Monday, they asked the highest court to review its decision to lift the stay on the trial, media reported. Prosecutor V. Sithambaram said it was up to the High Court judge to decide whether the trial should be delayed pending the review. One of Najib's lawyers, Harvinderjit Singh, declined to comment.